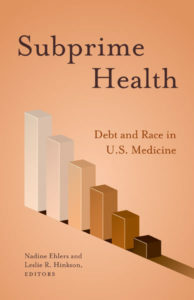 Subprime Health: Debt and Race in U.S. Medicine, edited by Nadine Ehlers and Leslie R. Hinkson, University of Minnesota Press, 2017, 248 pages, £86 (£21.99). I’ve always found an appropriate similitude between the words “inequity” and “iniquity.” Subprime Health: Debt and Race in U.S. Medicine, edited by Nadine Ehlers and Leslie R. Hinkson, deftly bridges the space between these two words. Drawing on the rich knowledge of eight professors of sociology and cultural studies, this collection of essays perceptively examines the manifestation of race and racism in the American medical institution. By examining the foundation within which race-based medicine flourishes, the book illustrates the construction of racialized debt as an active, engineered phenomenon. The agency required to propagate this system thereby demands recognition that the tangible, racial injustices of today are indeed iniquities—their existence is itself a wicked malevolence. In Part One, Anne Pollock states a central plotline of the volume: “The term ‘race-based medicine’ is often thought of as the development of race-specific pills, but we might instead see it as an entire system of care and its denial.” She repudiates the sequestration of race-consciousness as solely within the ethnopharmacogenetic industry, instead naming medicine as an institution marinated in unjust race relations. Nothing about our health system can escape the web of indebtedness. This is not a light book. It is a text that requires attention and merits time and slow digestion. I find myself hoping that healthcare professionals and policymakers will pick up this volume, though acknowledge that the book is more tailored to scholars. Newcomers to these disciplines and skeptics of the message may have some difficulty with the academic language and heavy metaphor, but to a large extent the argumentative meat of each essay rings with undeniable force. Subprime Health is full of dazzling, delicious insight. Drawing on themes of onus, ownership, dispossession, and burden, the authors weave rich threads that spell out the nuances of this racialized and unequitable web. What’s most gorgeous about this book is the way the topic is considered and appraised from the vantage point of women’s and ethnic studies, geopolitics, migration theory, and science and technology studies. The network of scholarly homes from which this book garners weight—the broad web of synapses that fired and labored to create this work—is made obvious in the way the book undergirds its examination of race-based medicine with thick layers of historical and cultural context. Each essay has the ability to saunter between compelling statistics I rushed to furiously copy down (for example, Leslie R. Hinkson’s investigation on the racialized Joint National Commission guidelines is well-researched and fascinating) to poetic imaginations that leave me melancholy and pensive (in Part One, Jenna M. Loyd asks, What happens to disintegrating bodies after they have been rendered a social sacrifice?). The complexity of analysis that is allowed by its rank of authors may be the book’s most important contribution. The breadth of multidisciplinary consideration gives insight to the way racial injustice operates in the American healthcare system and indeed readily leverages compelling critique against explanations or processes that do not adequately recognize the unjust conditions within which race-based medicine thrives. It explicitly disrupts the narrow mindset of biomedical thinking, which ignores issues of political economy to localize the arena of health disparities at the level of the individual. Catherine Bliss notes, for example, that “Because the genomic vision of race is not guided by a theory and is in effect un-theorized, it has not provided clear directions for researchers interested in conducting a gene-environment analysis that would apprehend health care and delivery disparities.” She argues that the notion of racial difference as innately genetic fails to acknowledge the vast ways in which social inequity (iniquity) has saddled communities of color with the burden of disease. Similarly, Ehlers and Krupar’s discussion of Medical Hot Spotting demonstrates how spatial profiling using GIS data targets “superutilizers” who are racially codified and demonized, so that the “victim becomes the culprit, the violator the aggrieved, the powerful the subaltern.” In ignoring the genesis of urban segregation and systemic marginalization communities of color face, the needy are transformed from subjects that society is indebted to, into burdensome wrongdoers upon which responsibility and debt is interned. As a third example, Benjamin and Hinkson also rebuff the disavowal of society’s role as a debtor by arguing against the notion that minority distrust of the healthcare system is a lamentable, self-produced “cultural trait” that hinders medical advancement. The authors oppose the popular notion that people of color owe it to their communities (and investigators) to participate in experimental research in order to solidify diverse inclusion. Instead, they maintain that given the historical backdrop of abuse and experimentation, it is researchers who owe a debt to the marginalized and must work to earn their trust. For why are people of color “in such demand as…research subject[s] when no one wants [them] as…patient[s]?” Taken together, these examples demonstrate how Subprime Health is able to illustrate the danger of decontextualized framing, and how failure to address the role of social inequity allows the onus of debt to be placed upon the dispossessed. The book is therefore powerful in its ability and demand to think critically not only for the sake of accuracy, but so actions moving forward lend efficacy towards the reach for justice. Subprime Health forcefully rejects the idea that a magic bullet to health disparities can be found in the realm of biomedicine, or indeed, ever. Despite the hunger for and promises of new genomic technologies, these means will never alleviate the “moral crisis of racial inequality.” There are no easy solutions buried within the genome, no holy grail embedded in the machineries of tomorrow. And yet, these endeavors are consumptive and costly of resources and time, effectively undermining support for social remedies proven to work. People of color deserve more than pills, plastic gel-coated possibilities, and fancy sequenced promises as their reparation. In its interrogation of the wide gap between the debt that is owed and the forms of compensation that have been pitched as remuneration, the book sings a loud and compelling mandate to reinvest in the social apparatus. For all this book’s importance, there are flaws. Most notably, the authors write in their conclusion that race could be used by future doctors “not as a data point…based primarily on population-level risk profiles, but as a factor to help contextualize individuals and their medical needs when information on things such as family medical history, present living conditions, and individual-level medical information are unavailable.” In a volume that is made strongest by its vividly nuanced examination of the racialization of medicine, how disappointing that at the close, its editors advocate that the politically-constructed perception of racial phenotype might be able to stand in—even at a modicum—for a series of variables overwhelmingly induced by social power. How could a snap judgment of race provide meaningful knowledge, and why wouldn’t “individual-level medical information” be available? Doesn’t this recommendation echo the rejected process of drawing conclusions from racialized “population-level risk profiles”? Because it is preceded by pages of robust analysis that undermine its message that race can and should be utilized so simply, this one statement of opinion does not necessarily ring as egregiously problematic. It is, however, one of the few explicit actions the authors propose for the use of race in clinical medicine. Thus, at face value, the assertion’s lack of the criticality (that is otherwise present throughout the book) remains a letdown. Who, in our nation, benefits from subprime health? Who gets saddled with the debt? Who is responsible for the payment? Who continues to pay, and are we paying attention? Subprime Health documents the financial burden of the nation’s racial debt just as it conceives it as something much greater. Readers are asked to consider the weight of human suffering in order to understand why the ledger of this nation is dripping in red.